Here are some of our most recent past projects developed in partnership with other organisations. Accompanying resources to these projects are available to buy from educational publishers or to download free of charge from our partner websites. Please email us if you would like to know more about any of the projects featured here. Our Nuffield Primary History project developed teaching approaches exemplified on our website by over 100 lessons for KS1 and KS2, in line with seven key principles for teaching and learning history. Now available on the Historical Association website. Our Design & Technology project included a comprehensive set of resources for both primary and secondary school pupils. These are now available to download from the National Stem Centre e-library. An A-level (or Diploma level 3) Extended Project helps students become better autonomous learners and enables them to study a topic of particular interest to them.. We developed a Student Companion and Supervisor Support File in partnership with Gatsby Technical Education Projects. The Learning Skills for Science (LSS) Programme was first produced at the Weizmann Institute of Science and adapted for the UK by the Gatsby Science Enhancement Programme (SEP). The Nuffield Foundation worked in partnership with SEP to develop the LSS project to support skills development at KS5. The project aimed to make Economics and Business accessible, relevant, and rooted in practice. 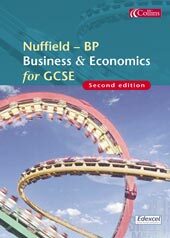 The development of an Advanced Economics and Business course was followed by GCSE and GNVQ qualifications (supported by BP). Our Citizenship project developed a range of cross-curricular resources for KS3 and KS4. These included some standalone projects such as running a campaign and the use of animals in research. Nuffield Primary Science was a set of curriculum materials based on the SPACE approach and published by Collins in 1993. Download the SPACE research reports for free.